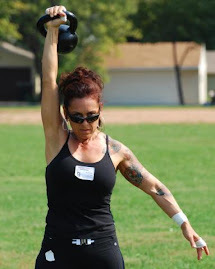 Tracy Reifkind's Blog Living My Physical Potential: I hate double swings. I mean, 'dislike'. 40 2 hand swings, 1 min work, 1 min est x 5 sets = 10 min. 8 dbl clean/ press, 15 dbl swings, 1 min work, 1 min rest x 10 sets = 20 min. 10 sets total (5 each) = 20 min. 10/10/10/10 bottoms up cleans, 2 min work, 1 min rest x 2 sets = 5 min. You are so funny with the "H" word! I have not attempted heavier doubles workouts yet. I need to add that to my list of things to do! How are you enjoying the unemployed life?? I can't wait to have some time off. I always make sure to take at least a few months off when I quit a job. I plan on visiting a friend in the Seattle area for a week and then do tons of exploring of the Denver area when I get back. How is couple's yoga going? I'm very impressed with your double clean form and its seamless setup for the push press .. it looks absolutely perfect. I need to visit here more often again .. great work! Couples yoga is the best! Now Mark's yoga mat is right next to mine (instead of behind) so we can hold hands during savasana! I call it a swing/clean! It's more "rythmic"...it's suits my style of training. I call my bottoms up clean, a bottoms up swing also, lol!